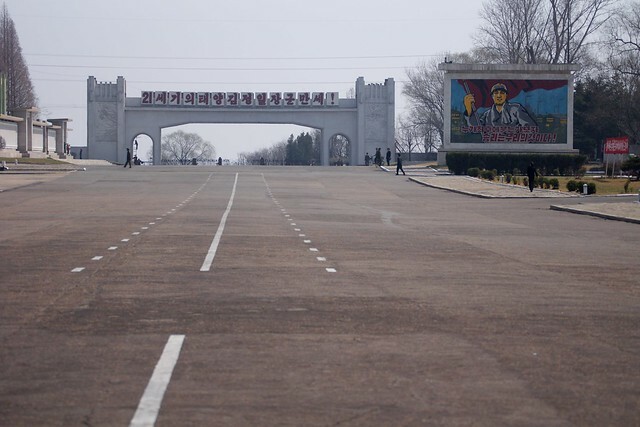 Closed during the height of the spring 2013 tensions, the Kaesong Industrial Complex will probably never be a tourist attraction, even if reopened. 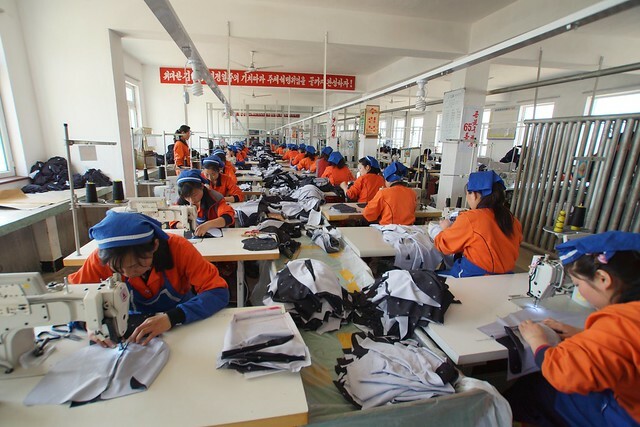 But if light industry is your thing, it is still possible to gain access and check out the behind the scenes action at various factories in the Rason Special Economic Zone. 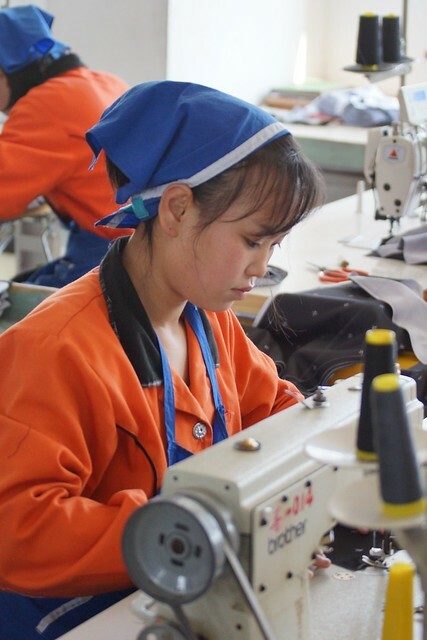 Despite sanctions, one of the busiest factories I visited in Rason was the textile and garment plant. 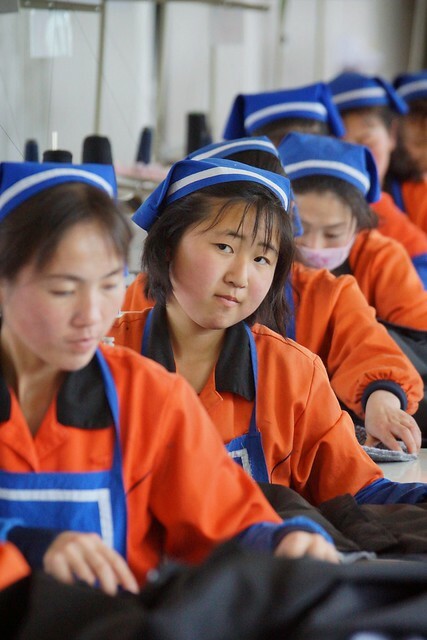 During our visit my group was led to the 2nd floor production halls where we watched Chinese supervisors make rounds to oversee the quality of work of the local North Korean staff. 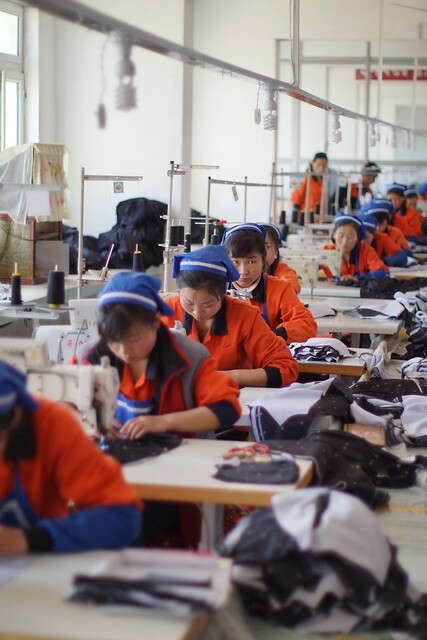 There were no children working at the plant, the work space was clean and well ventilated, and in the parking lot we witnessed the distribution of the worker’s monthly rations. 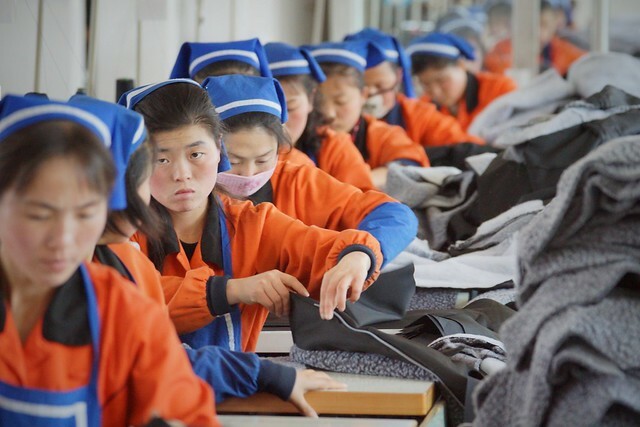 But for those who must have controversy and scandal when it comes to North Korean issues, I can report that the tags on the jackets being produced there claimed “Made in China”. 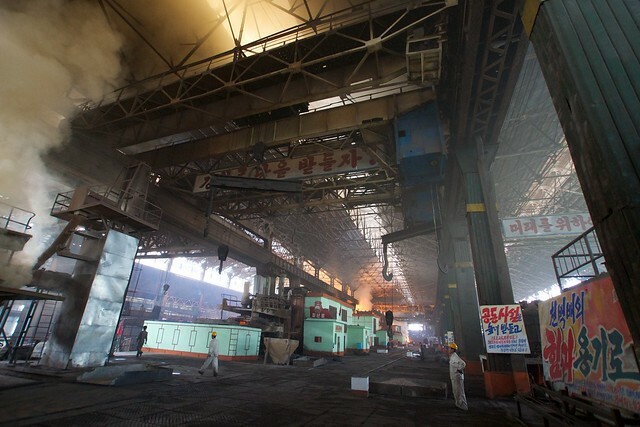 In the spring of 2012 I was able to visit the Nampo Tae’an Glass Factory, one of several Nampo area heavy industry sites briefly open to tourists at the time – currently only the Nampo Kangso Mineral Water Factory is advertised as available for visits, a site which is included on my Spring 2013 tours. More modern than I expected (the plant was built in partnership with the Chinese and opened by Hu Jintao in 2005), inside we were able to get a close up view of working furnaces and sheet glass cutting machinery, as well as a look into their computerized production monitoring control room. 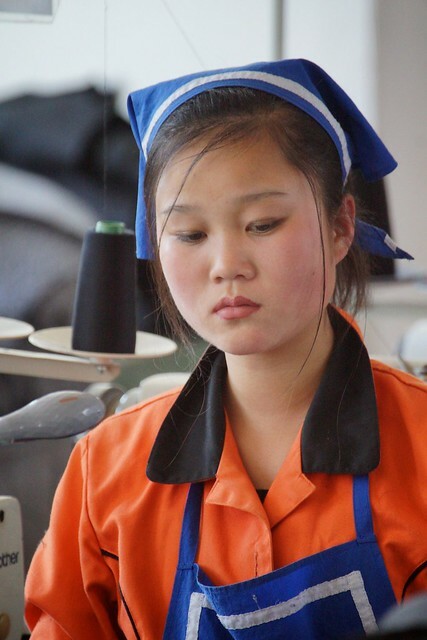 I expected to see communism in action, mass mobilization of the workers and all sorts of other cliches, and while I witnessed that sort of thing out in the fields and on countryside road construction projects, I was surprised to find the Nampo Tae’an Glass Factory eerily quiet. 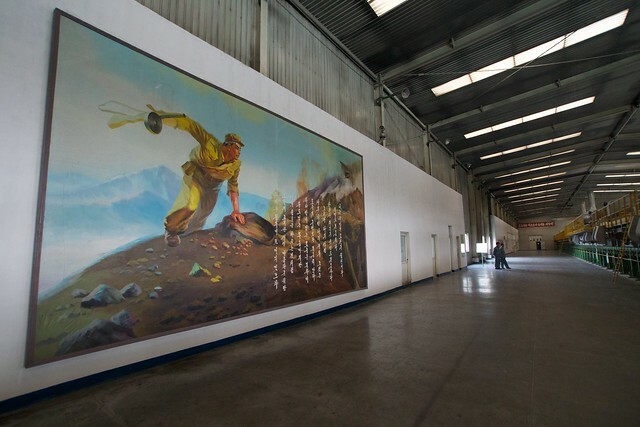 Massive propaganda paintings on the walls looked down over just a handful of quality control workers, but the plant was producing glass, and I left the site suitably impressed by the operation. 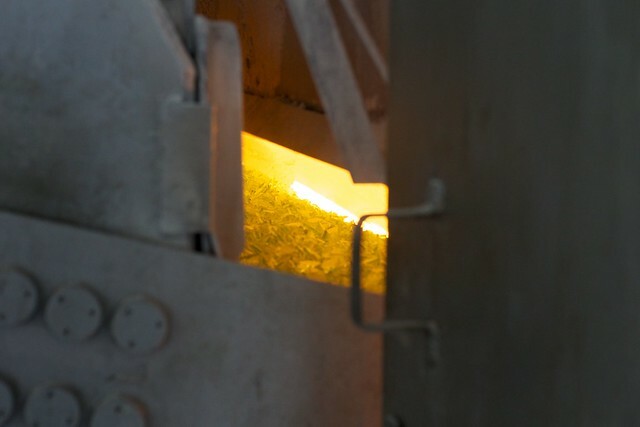 Close up view into the glass furnace. 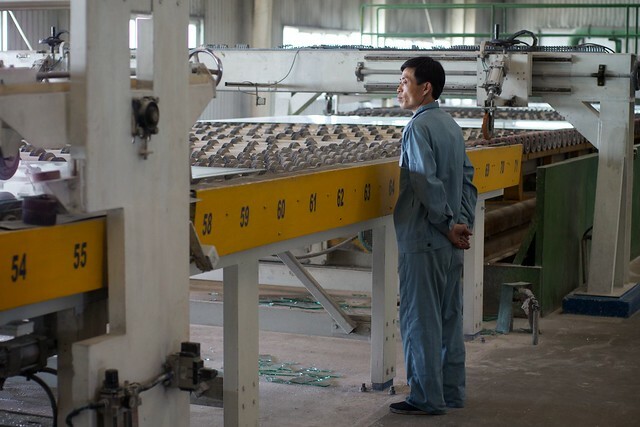 They let us climb up on the machinery – so dangerous! 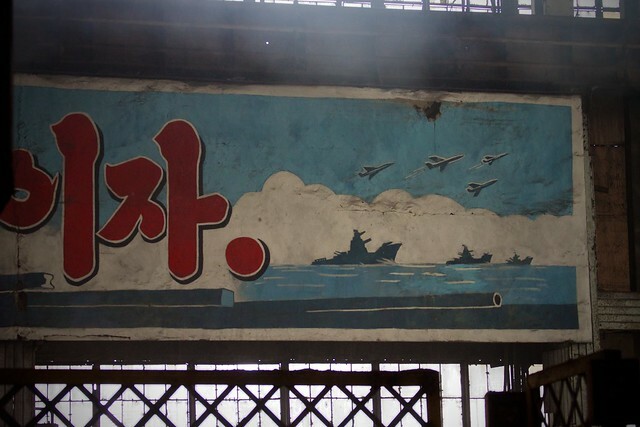 Propaganda painting on the production room wall. Lady in the quality control booth. 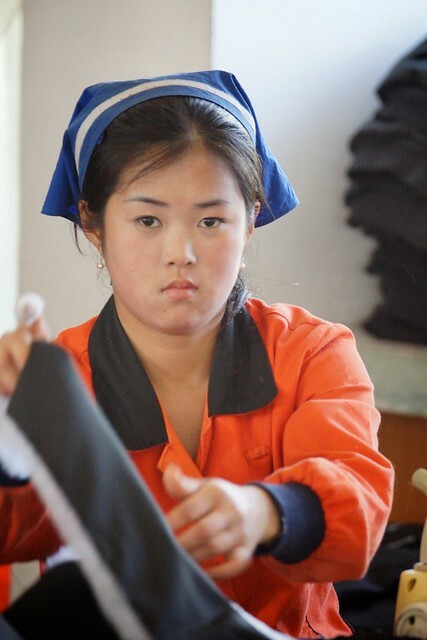 Nampo Tae’an Glass Factory local guide. 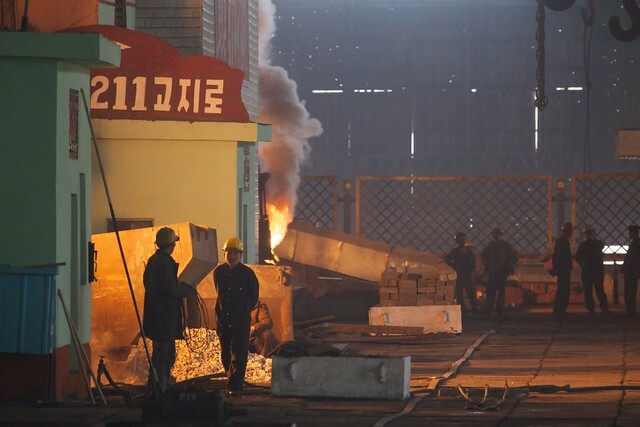 The Chollima Steelworks, a North Korean showcase heavy industry site located outside the west coast city of Nampo, was recently opened for tourism and we were among the lucky few to make a first visit. 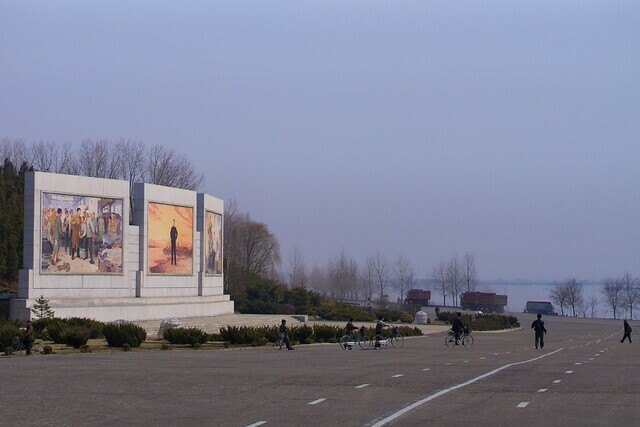 A historically important site, Kim II Sung and Kim Jong-il made many visits, the Chollima Steelworks is an impressive complex with wide boulevards, rail infrastructure, grand propaganda murals, and imposing buildings. 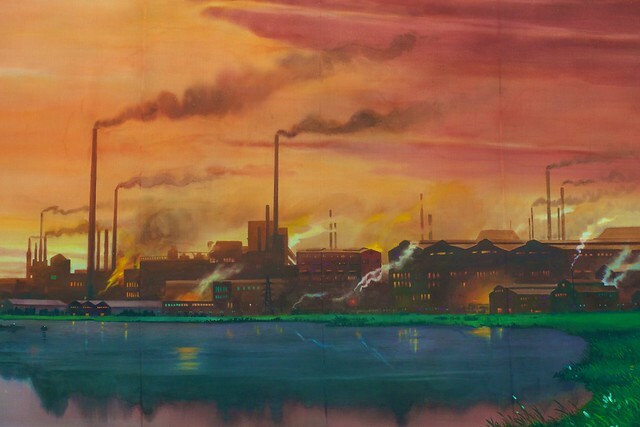 Being amongst the first western visitors, instead of the ubiquitous local guide, we were greeted by a large group of officials and representatives of the steelworks who shuttled around the complex in large black luxury sedans. 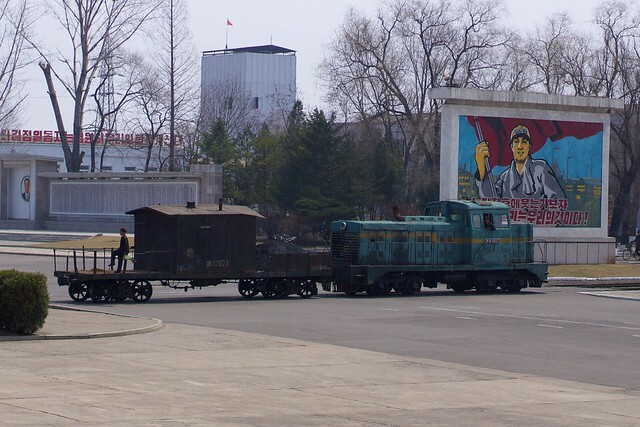 Of course they showed us the local museum dedicated to the visits and on the spot guidance of Kim Il sung and Kim Jong-il, but the highlight of our tour was our access into the steelworks itself with a close up inspection of a functioning electric arc furnace on the production floor. 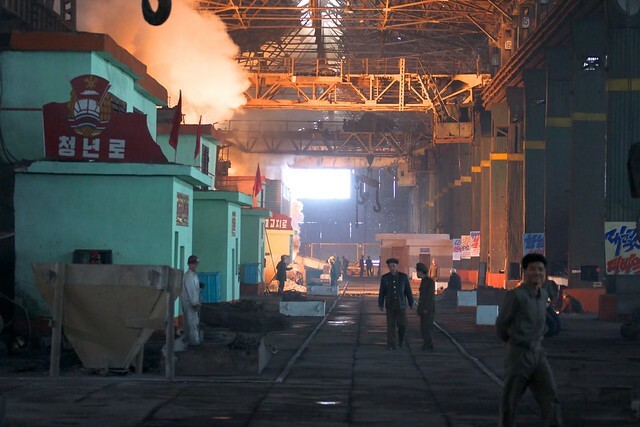 This visit to the Chollima Steelworks was part of the new Heavy Metal Tour add-on package offered by Koryo Tours. 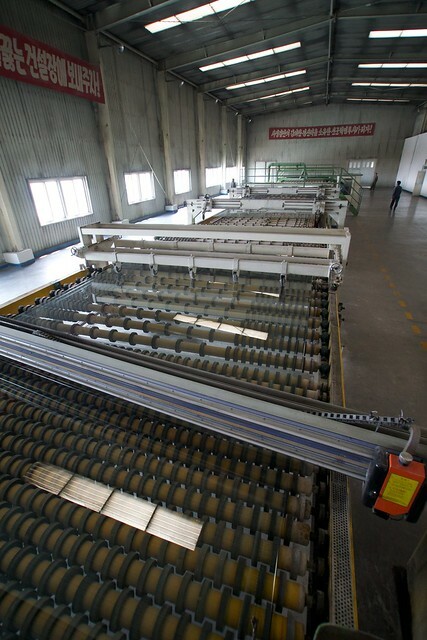 Also included in this tour was our visits to the Nampo glass factory and the Hamhung fertilizer plant. 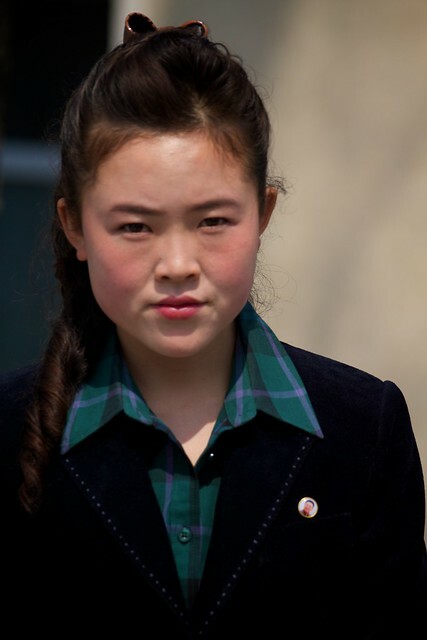 We had unrestricted photography access to each site, other groups had their visits restricted to a bus ride through the parking lot with no photos allowed. These groups had shadowed us at times and were continuously in trouble with their guides for breaking photography regulations – for the best access it pays to follow the rules set by your guide! 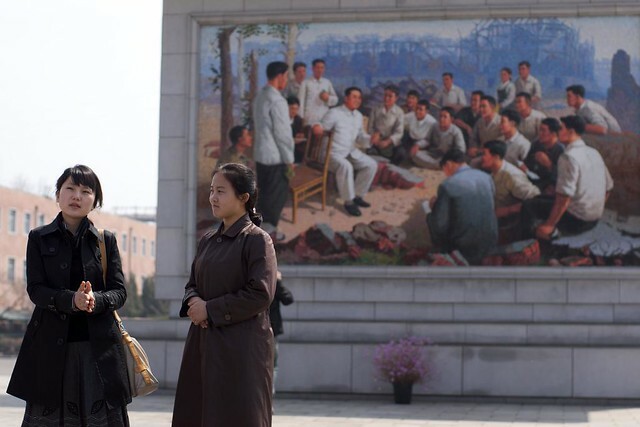 Our guide Ms Han and the local guide in front the Chollima Steelwork’s Kim II Sung mosaic. 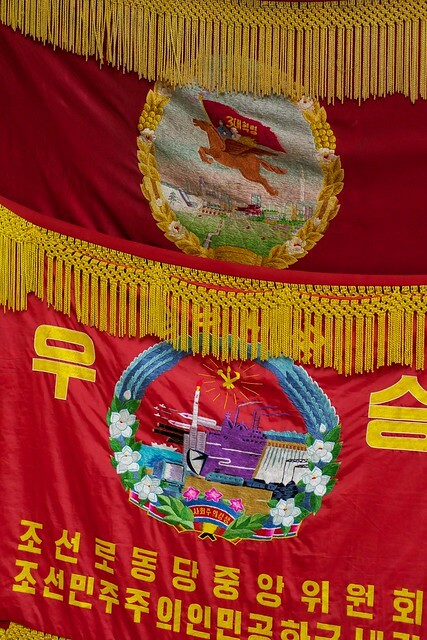 Chollima Steelworks representative and worker. 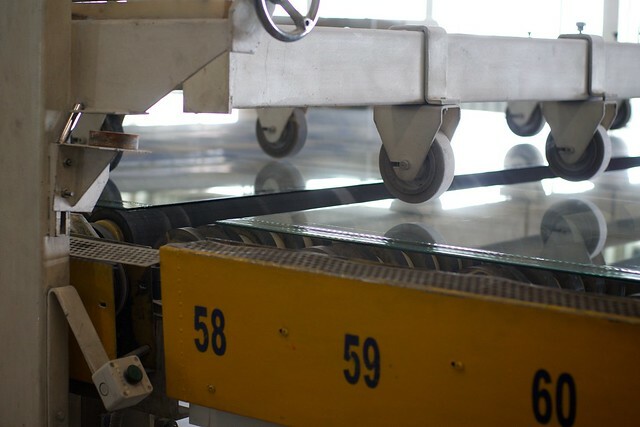 As we did not venture too far onto the factory floor hard hats and safety gear were not provided for us. 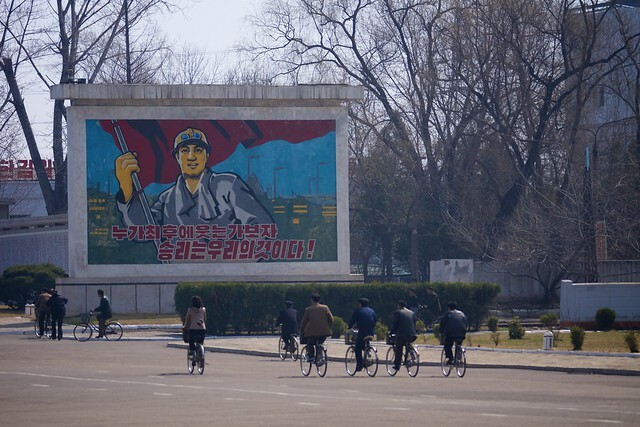 On close inspection you can see only about 50% of the workers have hard hats on. 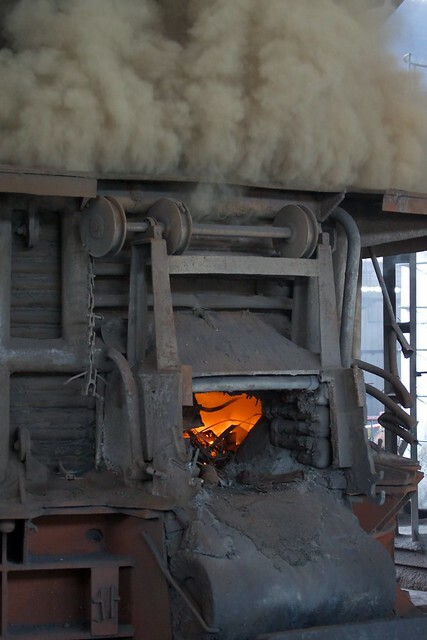 Close up of the electric arc furnace. 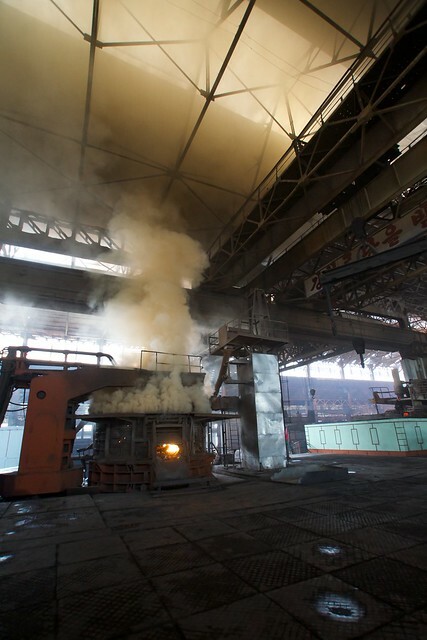 Electric arc furnace in wide angle. 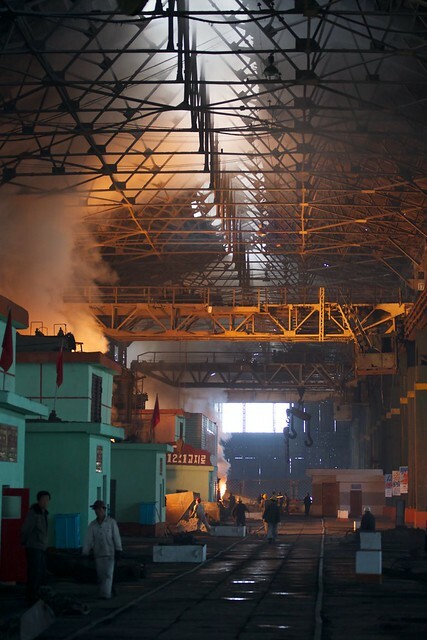 Chollima Steelworks production floor in wide angle. Propaganda on the production floor. Achievement banners at the steelwork’s museum. 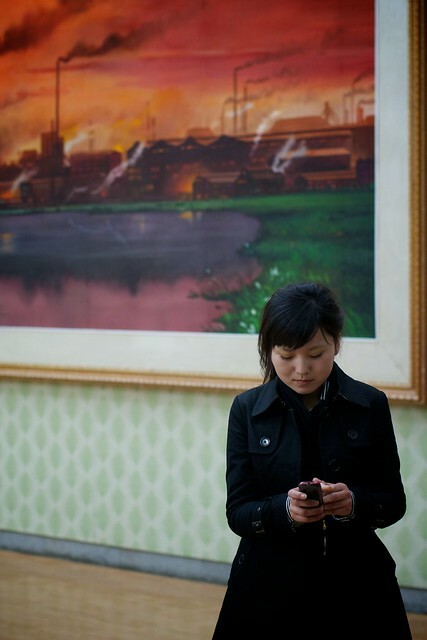 North Korean guide Ms Han and a Chollima Steelworks painting.